One year after the Fukushima disaster and 26 years after the explosion of the Chernobyl reactor, the discussion on civil nuclear energy has again reached the “normality” of planning for new power plants. 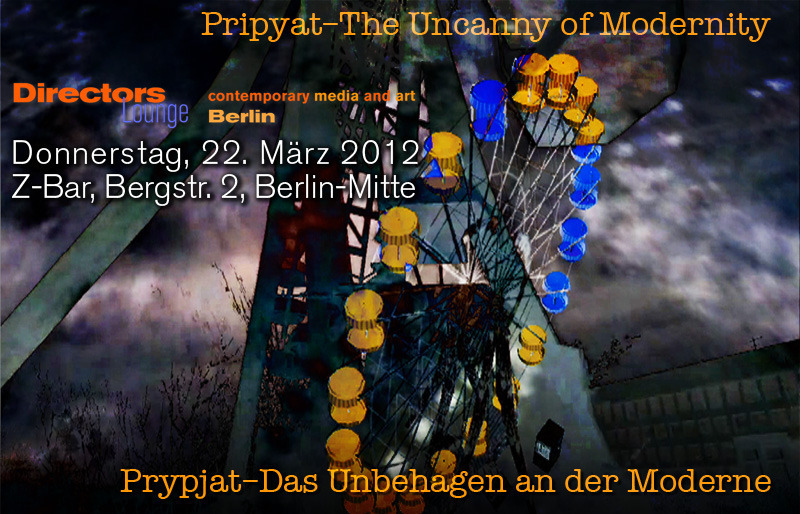 Over the same time, Pripyat the destroyed young Sowjet city, now situated in Ukraine, has gained an eerie attraction. 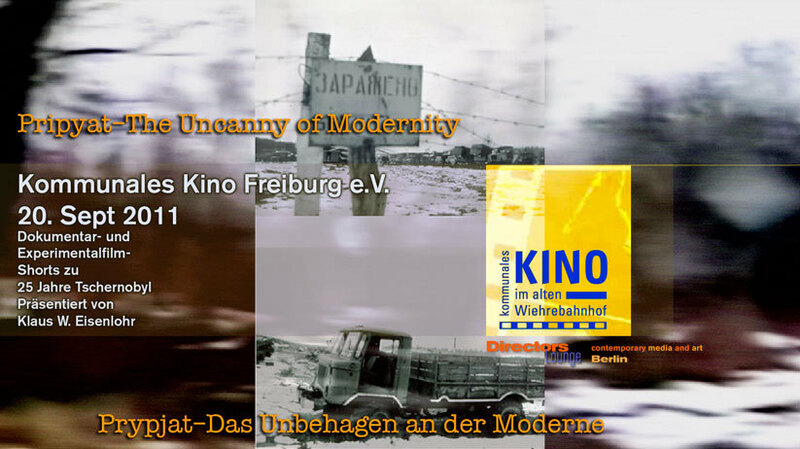 Firstly presented in Freiburg DE, the collected films allow a discussion of the human imagination triggered by nuclear energy and nuclear disasters beyond excited press news. Presented by Klaus W. Eisenlohr. The film program comprises films representing visions of the abandoned city of Pripyat by artists and documentary filmmakers, and imaginations of futures under the influence of “peaceful nuclear energy”. 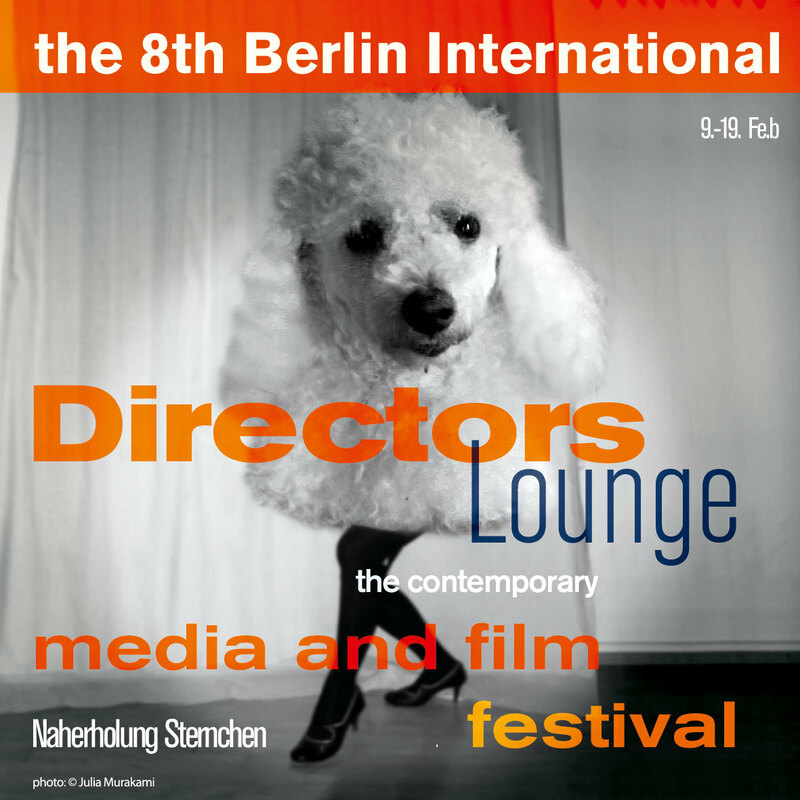 [DL8], The 8th Berlin International Directors Lounge, the festival for contemporary media and film, 2012, is hitting Berlin in a new vein and venue, this year making the up-and-comer insider tip Naherholung Sternchen its stomping ground. The reason for the move will be clear to all once they hit the doors, literally a stone’s throw from the iconic Kino International near Alexanderplatz: the location, a one-time thespians’ hangout already steeped in its own history, has clearly been waiting for this moment. This place wants to be, and [DL8] is the ticket make it happen. 1001 nights at the cinema, all in eleven days, films like you forgot or maybe never knew they could be made, films that will change the colour of your eyes and thoughts… on-beat, offbeat and everything between. Two films, two film essays about public space. 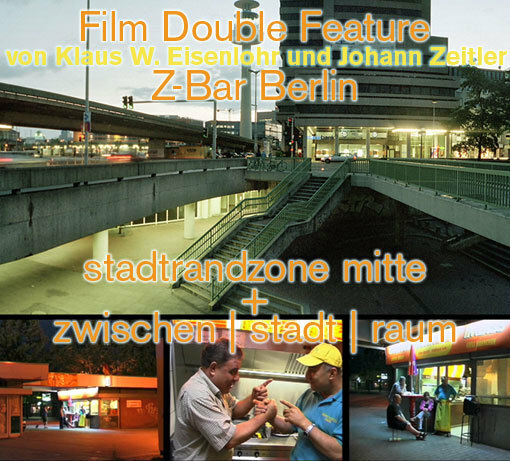 One is based on performances including public interventions on urban plazas in Hannover and the second film explores encounters in public space in Gropiusstadt, a modernist residential area in the South of Berlin. Both films bring forward issues of public space and urban development: Will public space disappear under the changes of globalization and the development of an electronic public sphere? Are there new meanings and new functions of urban public space that could reactivate public space also in urban areas outside of the historic center of cities? Do we still need public places, or urban community space in the larger metropolitan areas? Both films developed from visual researches in the respective urban areas and may be best described as visual essays. Klaus W. Eisenlohr is a lecturer at Photocentrum Kreuzberg and at Lexia International in Berlin. His media are photography, film and new media. Johann Zeitler mainly works with painting, performance and drawing. Both artist have collaborated on urban and film projects since 2003. 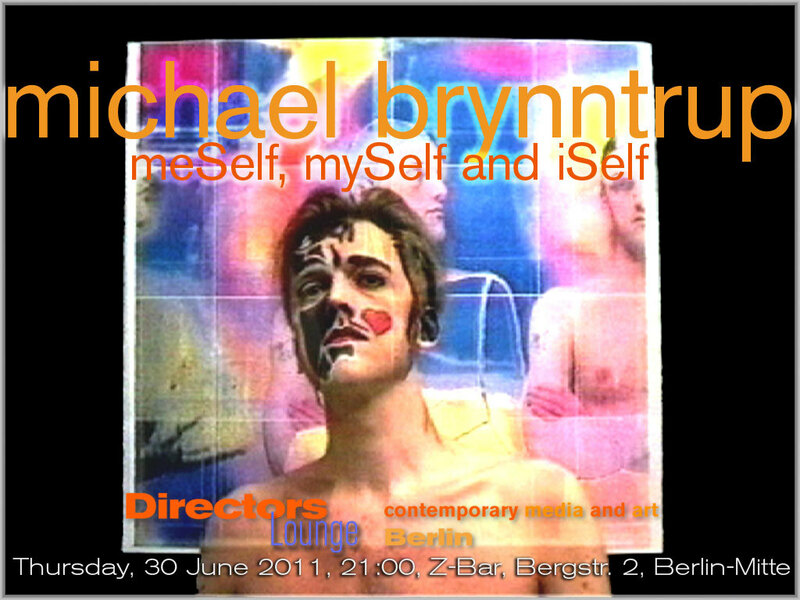 Digital video works by Steven Ball 2003 – 2010. These works travel near and far, across physical and virtual space using material collected en route. Travel determines form, subject and object are fluid entities, digital experimentation becomes landscape study, hyperlocal excursion, and experimental documentary, as they explore and exhaust species of spaces and media. 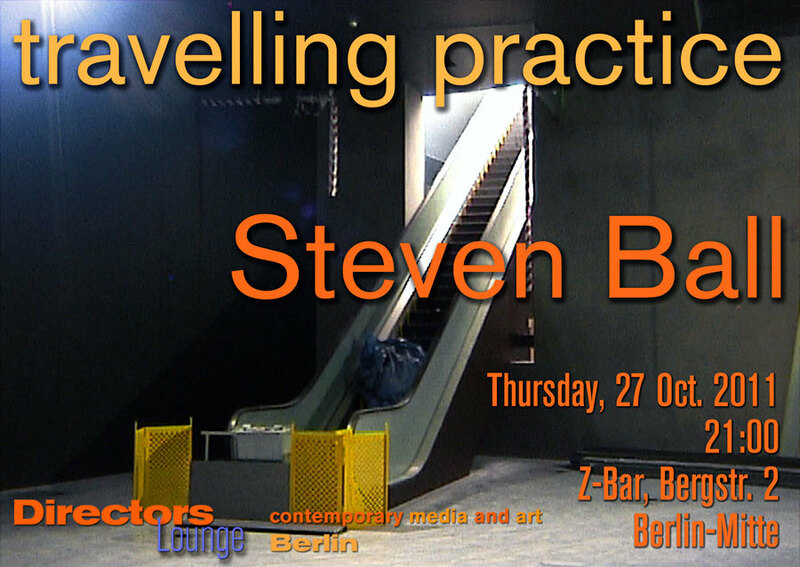 Steven Ball has worked in film, video, sound and installation since the early 1980s. In the late 1980s he accidentally migrated to Melbourne, Australia. There he continued his practice making a number of film, video and sound and installation works, as well as being engaged in various curatorial, administrative, teaching and writing activities. Since returning to the UK he has worked predominantly with digital video, producing a series of works, which among other things, are particularly concerned with digital material processes and spatial representation. 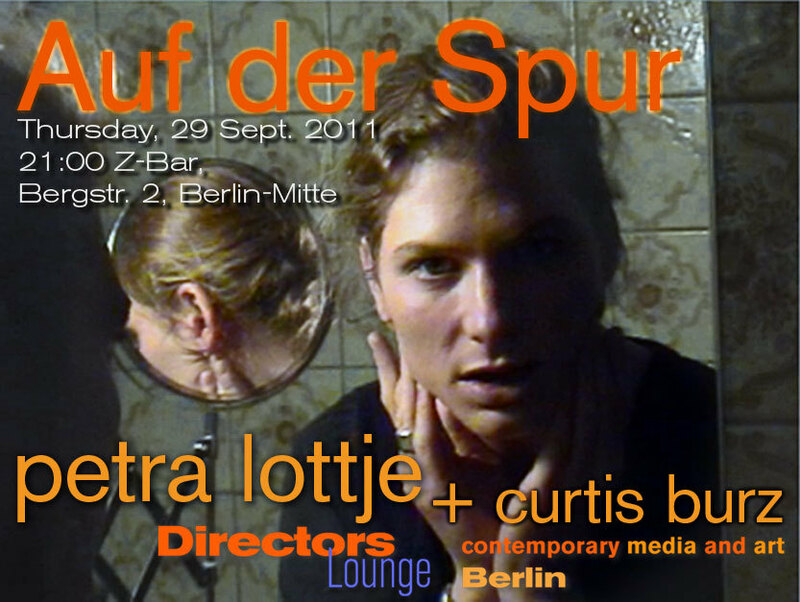 Directors Lounge präsentiert ein Programm mit Petra Lottje und Curtis Burz. Beide Künstler, aus ganz unterschiedlichem Hintergrund, Bildende Kunst bei Petra Lottje und die dokumentarische Tradition europäischen Kinos bei Curtis Burz, befassen sich mit zwischenmenschlichen Beziehungen. Ob diese nun eigentlich „auf der Spur“ sind (on track) oder „abseits der Spur“ (off track) bleibt auch über die ambivalente Benutzung der Medien oder des Recordings bei beiden Künstlern offen, oder hängt davon ab, welchen Blickpunkt der Beobachter (Zuschauer) selbst einnehmen will. In drei Episoden aus dem dokumentarischen Essay „Ich habe Dir nie erzählt, womit ich mein Geld verdiene“ (2011) erzählt Curtis Burz von Menschen, die sich scheinbar in der Mitte der Gesellschaft bewegen, aber doch nur „vom Rand“ aus zuschauen. Die Geschichten basieren auf Interviews, die der Regisseur in der Zeit 2008-2010 geführt hat. Gair Dunlop confronts historical material about the glorious future that Dounreay Atomic Research Establishment would provide with his own camera footage, shot after the shut-down of the research power plant (Atom Town: Life After Technology). Now a ruin that still radiates, Dounreay does not attract nuclear tourists, unlike Chernobyl, which has become a popular destinations for photographers and other contemporary “explorers”. Julio Soto presents his imagination of cities after a climate or nuclear catastrophe in virtual images (Invisible Cities) just before he went to Pripyat himself in order to make a documentary about past and present inhabitants of the forbidden zone (Radiophobia). Vanessa Renwick in glorious pictures celebrates the good-bye to Trojan, a power-plant in the US that may be the equivalent to Brokdorf in Germany concerning the long-lasting local protests, but which was never going on-grid (Portrait #2: Trojan). And Thomas Bartels reflects in poetic pictures of 16mm film the mood of the year 1986, now almost a documentary of the mood in Germany under the influence of the clouds of Chernobyl (Zwischenlandung). Chernobyl may have become the symbol for the crumbled future visions of modern prosperity made possible by peaceful nuclear energy, and for the apocalyptic imaginations of a modern catastrophe. However, it has also triggered an array of aspirations for adventures. Maybe less so the actual melted and broken reactor, shielded under a crumbling “sarcophagus” but the ghost town Pripyat, once a young modernist city, has become a collective iconographic symbol for the uncanny modernity that seems to attract people in many ways. Jakob Kirchheim combines different art genres in very personal ways, genres that usually are not connected with each other. He creates films and paintings using linoleum prints. The seriality of printing initially made the artist experimenting with film. He has used a variety of animation methods without leading him to classic animation forms. The ways Jakob Kirchheim also includes words and maps then results in political meaningful references, and they partly remind of the styles of agitprop from the 1920’s, but also from the 60’s and 70’s. However, the artists likes to see them as media references rather than just bold political statements. These references seem to say, «Agitprop? Isn’t that pure poetry, anyways?» Already in 1987, Jakob Kirchheim conceived his first «Linolfilm», a stop motion film based on linoleum prints as a combination of words and images. Since then he further developed his film techniques using photographs, collage techniques and live footage, and he thus has produced over 20 experimental animation, poetry and documentary films. FLEX: the Florida Experimental Film and Video Festival presents a program of highlights from their 2011 biennial competitive festival. FLEX is interested in an expansive notion of experimental media. “Work may draw on documentary, animation, avant-garde, underground, or other traditions—or no traditions at all.“ As such the programming comprises a variety of mediums from 16mm direct animation to found video and from laconic place studies to experimental love poems. Since its start in 2004, Flexfest has become one of the most important festivals for experimental media in USA, challenging us to rethink what ‘experimental’ means. Roger Beebe, who is the artistic director of Flexfest, and who is currently teaching a 5 week workshop at LaborBerlin, will present the program. 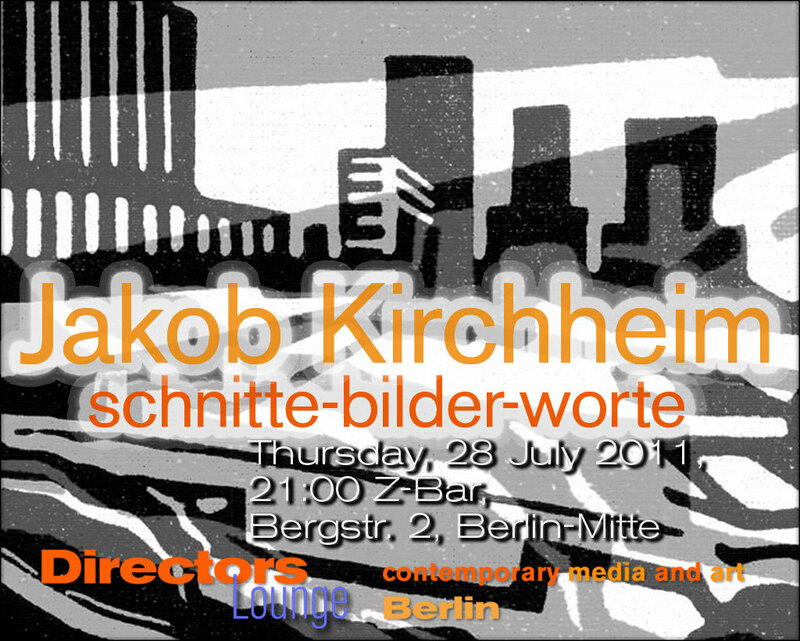 He was already a guest at Directors Lounge in 2009 (Link). Roger Beebe will be available for Q&A. 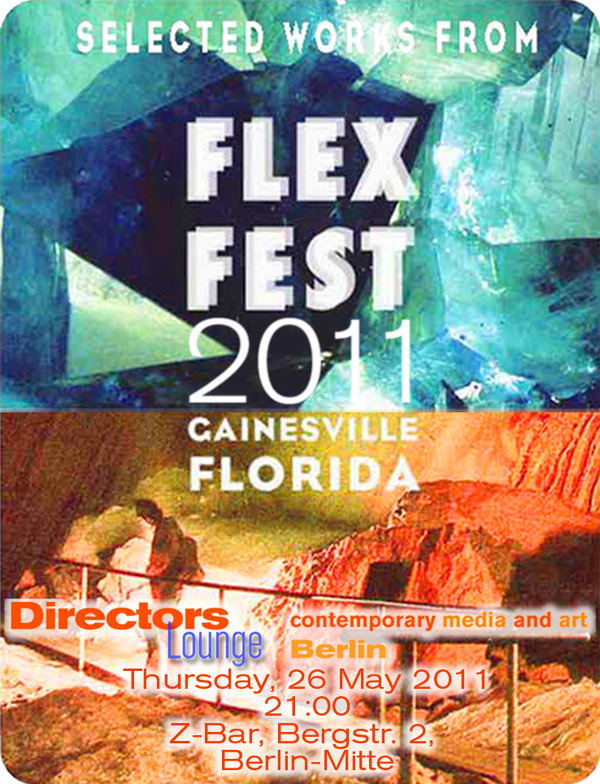 The Florida Experimental Film/Video Festival presents both year-round programming and an annual festival (FLEXfest) in Gainesville, Florida. Showcasing a broad range of experimental media, FLEXfest alternates a biennial competitive festival with a biennial curated event. Past FLEX guests have included Craig Baldwin, Jim Trainor, Helga Fanderl, Deborah Stratman, Ben Russell, Robert Todd, Leighton Pierce, Naomi Uman, Bill Brown, Scott Stark, Jacqueline Goss, Johan Grimonprez, Vanessa Renwick, and many others. Alina Skrzeszewska created a colorful, sad and thoughtful film about the shadow sides of downtown Los Angeles, not without showing strains of hope. And there is music, songs by the protagonists starring in the film. The Nickel, the Eastern part of downtown used to be an isolated island in the urban grid of L.A.: historic but sordid former grand hotels; the number of homeless people surpasses the number of inhabitants multiple times; a network of christian missions and charity organisations are entangled in what is called the Skid Row; from 10 pm through 6:30 am you are allowed to sleep in the street (but then you have to move); there is a lack of over 12,000 beds for homeless shelter; on the other hand, a massive police presence and the reign of crack makes life in the street like a trip to hell. In this strange otherworldly urban zone, the old hotels seem to be islands in the stormy waters, and they are the cheapest places to live in town. Here, the artist Skrzeszewska rented a room for over one and half a year while shooting for her film. Those who live here, and whom we get to know in the film, have at least some kind of steady income, a job in the hotel, a veteran pension, or social welfare for the disabled. They were able to leave the state of homelessness or the circle of jail and drugs. Thus, for Alina the hotels are a place of reflection, a retreat from the “war in the street” as Alina calls it. “In the street there is never time for thoughtfulness.” Therefore, she uses these odd spaces of retreat that the hotels are as spaces of reflection — and possibly projection — to discuss life and the society that creates those biographies missing any hope. The artist’s conditions for a talk in front of the camera was openness to have an earnest conversation. We see very little “false” acting in front of the camera, maybe because the artist does all the recording on her own, and it is this sincerity of a “one to one” talk and Alina’s honest interest in the story of her counterpart that makes her bridge the gap: A young European woman who studies at CalArts and the finally settled tramps. Some of them tell stories of their life, they never told before. We get to know there are many reasons to strand at the hotels of the Nickel. Some were dropped out by the society that fits only for the fittest, and they lost everything they had in the past. Others decided not to “play their game.” All of them still seem to be untouched by the epidemic that now spreads for 2 decades: crack. In such a way, Alina Skrzeszewska also shows to us the poetry and wisdom of the underprivileged, all of which recorded by a camera that was inspired by Edward Hopper and the reading of Charles Bukowski, as Alina admitted to herself after she had finished the film. The positive notions of the film however derive from the examples of anarchistic renderings of their interests, like the illegal music studio in the hotel’s basement. It’s that very American idea of the self-made man that is still valid, and the roots of American pop culture based in the will of the poorest men to survive in dignity that are still showing, here. A. Skrzeszewska, who was born in Wroclaw in Poland, and who lives and works somewhere in between Berlin, Los Angeles and Vienna, will be present at the screening at Z-Bar and will be available for Q&A. 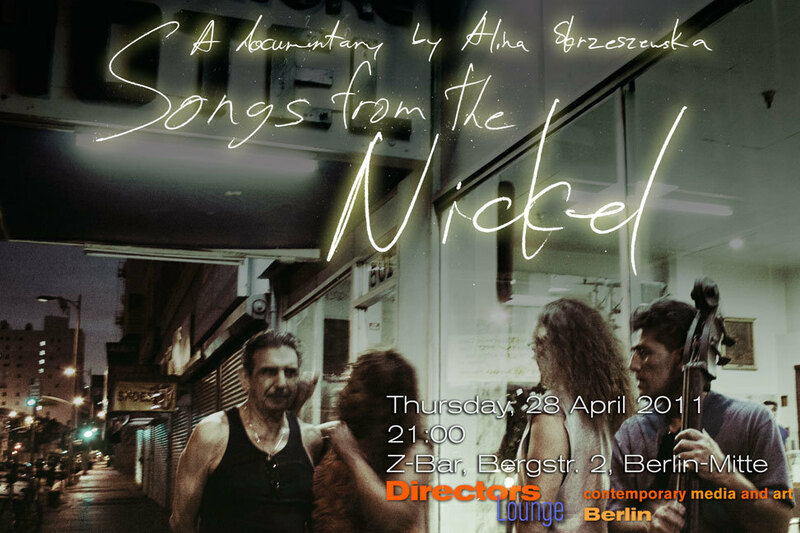 In addition, Alina will present the short film “Notes from the Fields”, 10 mins, showing a day’s cycle on the crossing of 5th St. and Los Angeles St. in The Nickels.